I’ve had another purge of my wardrobe. I decluttered a great many things before I moved in to this little flat, and not just clothes, but kitchen equipment, books, ornaments and pictures. Why is this item here, I asked? Do I truly want to keep this? In a shiny modern Ikea cabinet I’ve kept a few items, including my mother’s teapot and two vases of hers. Actually it’s important not to be dominated by one’s parents things. Immediately after their deaths I had Edwardian furniture and other artefacts from their life, which I kept for a while, but after a couple of years I said goodbye to. They were my parent’s taste not mine. There’s also a new teapot in the cabinet that will never be used because it’s art! You’ve seen my yellow wall with the one painting. It’s all very minimalist and that’s how I want it, but you don’t have to be minimalist to de-clutter. Apparently, Margareta Magnusson who wrote The Gentle Art of Swedish Death Cleaning is not at all minimalist in the way she lives. She had to remind a journalist, who expressed surprise at seeing her cosy and very fully-furnished sitting-room, that she’d moved to a small flat from a large many-bed-roomed house with acres of land. De-cluttering just means you clear out stuff you don’t need. But (puts hand up to face) one year on from our move the clothes and hats were creeping back. So, last month I went through my wardrobe and out went two large bags-worth of clothes. Then yesterday I went looking for summer frocks (because, at the moment we have a heatwave and it’s hot weather) and I realised I had hardly any dresses. I mean I have cruise dresses aplenty, no way, have I got rid of those! But a cool floaty frock? Not many of those were left. I’ve still got this one, which I’ll wear today. And I’ve still got this combo. The skirt was bought in Tobago for next-to-nothing and the top is a very old charity shop one and I just love the way the colours are jumbled together. I’m wearing those shoes today. I can see from the pic (taken last year) that my hair was at the half-and-half stage. As it’s now totally grey and white I’ve bought some of those products that you’re meant to use on white hair, to make it shine and be whiter rather than greyish and dull. I’ll report on these shortly when I’ve used them. I’ve also still got this skirt. I haven’t got a pic of this, but it’s got a stiff, red tulle underskirt, which gives it a swing as you walk. 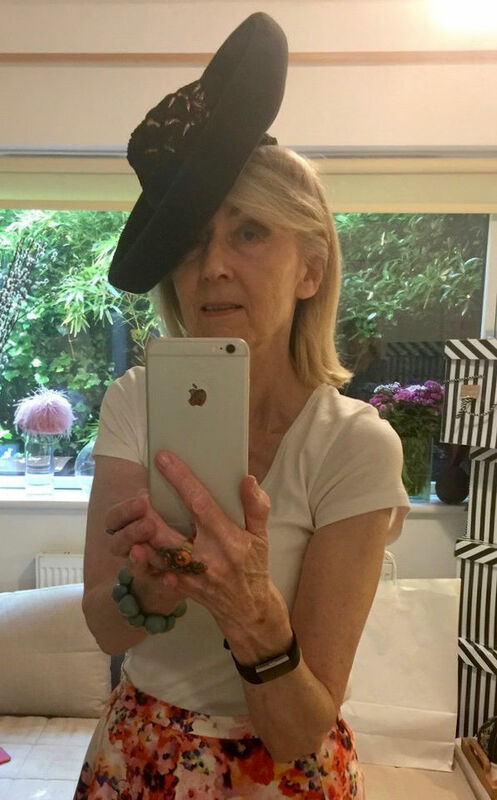 I wore the skirt recently when I visited Joanna of JoannaZaraMillinery to try on various hats. That really needs a better shot as it’s a beauty. Yes, if you need a wedding, christening or Ascot hat Joanna is your person. Here’s another. You might just be seeing one or two more of her hats in the winter! But back to dresses. The dress I really want is a kind of traditional tea dress. I want it to be floaty and cool with short sleeves and a sticky-out skirt. There are plenty of those at very inflated prices in the vintage-type shops in Brighton. I absolutely can’t afford them, so I’m looking in charity shops. But what do I see? Either dresses made from synthetic material (not in this weather) or, often, as this is Brighton, you can find dresses like these!! All at £100+ but aren’t they amazing! I’m off to Suffolk for a week and there may be more linen and cotton dresses in charity shops there. By the way, I’m sure you know that cotton is a very thirsty plant and in our search for cool summer clothes we are depleting the planet of water. It’s a conundrum but something we should think about, so my aim to buy a cotton dress in a charity shop is not only saving money it is saving the earth. ← Living life to the full! Viscose is a good choice for cool dresses. It’s made from wood pulp – or so I’ve been told. It’s best as a jersey or as a crinkle fabric which does not therefore crease. I’m wearing a crinkle viscose (second-hand) dress today. Just got 3 dresses on e-bay total price with postage about £16. Three I had already are now going to the charity shop to maintain the -admittedly large- number stable. De-cluttering needs to be a way of life for me! I’m not very sentimentally attached to things and have been quite ruthless with my Mother’s stuff after her death last year. I’ve started using Elnett hairspray like she did, the smell reminds me of her as much as any possession. 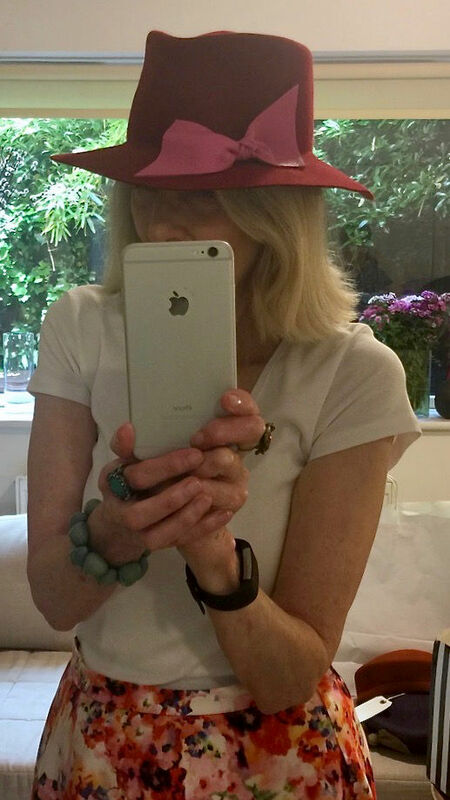 Love hats too -got a new summer one at TK Max for a fraction of original price. Hopefully it will last many years. I’m now too old for sparkly dresses with full skirts – I’ll leave that to my grandaughters’ when they have their ‘proms’. I like a lot of sparkle but prefer a more fitted shape! Yes, you’re right viscose is a good fabric and less costly than cotton. RE: mothers and their perfumes, I remember the Helena Rubinstein lipsticks she always wore along with face powder and that’s the smell I associate with her – face powder. The swansdown powder puff especially had that sweet lingering smell. I honoured my father by publishing his memoir and have made a non-published photo memoir of my mother for the family. I have kept a few of her things; like the two vases, a paperweight, an Indian artifact or two and, that teapot. But their furniture was of another age, and my children said, no, so it was a goodbye to all that! Those sparkly dresses were prom and Pride dresses so not for me either! I love your summer clothes especially that marvellous deep green dress. I do hope you find some lovely cool and pretty summer dresses in Suffolk. I love your red sandals; they seem to go with lots of things! You do find some wonderful bargains. Where I live charity shops are getting more and more expensive, but yesterday in a charity shop in Suffolk I nearly bought a black linen dress but as it wasn’t totally right (an over-large fussy tie at the back) AND as it was priced at £15.99 I thought, no! Now if it had been £10 cheaper, I might just have tried it out. We must remember that charity shops have overheads, unlike people selling on auction sites. (I’ve noticed that prices are rising there too.) Their purpose is to raise money for their work and if the cost of new clothes rises the cost of second-hand one does too. It can be annoying when they over-price items that cost very little new yet don’t ask enough for better quality goods. It is a difficult balance between getting the best price and actually selling the items. (You can tell I volunteered in one!) It depends where the shops are located of course and the quality of the donations. I’ve just paid £16 for a new-looking recent Joules dress in a charity shop and I thought that was good value. Love those hats, especially the wide-brimmed black one and the Fedora. Thanks for the recommendation. 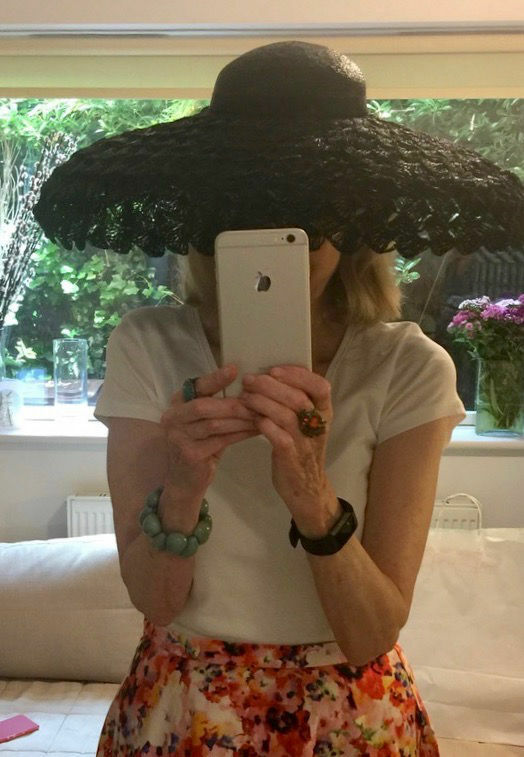 Her hats are wonderful – if you go to Ascot you know where to get a hat! That is a fabulous skirt! The floral one! Have a great week in Suffolk! Hi Penny, I have found that by using a good pinch ( maybe a tablespoon for long hair like yours)of bi carb mixed in your hand with with your shampoo every third or fourth wash will remove any yellowing from your hair and make it feel squeaky clean, I also use a conditioner for silver hair which is purple but makes your hair an icy silver which I love, you can also get a shampoo in the same brand but don’t do what I did and use them together when I first bought them, my hair went a really drab grey but if you use one or the other with your normal shampoo or conditioner the results are lovely.I am always being asked what I use on my hair to make it so silvery. I also mix a pinch of bicarb with coconut oil to gently exfoliate my skin after I have cleansed it, I find other exfoliants way too harsh on my 73 year old skin and after I wash it off with very warm water my skin retains the moisture of the coconut oil but does not clog up my pores like some night creams, I don’t know if I could live without my bi carb and my coconut oil, they are better than any expensive products I have ever used and best of all they are natural. You look so good in hats Penny, you could just about wear them every day here in Queensland, its winter and 23 degrees, heaven!!! P.S We’re having a hot spell here and it’s reached the heights of 24 degrees on the East coast and expected to be 25 today – hotter in London at 28! Actually high pressure is hovering over the UK so it is an unusually cloudless blue sky, which is lovely. That pineapple dress is so wonderful and it seems that Wenesday was National Pineapple Day. The hat shop visit looked like so much fun! That’s what I do when I visit Amina’s Millinery-try on hats and take pictures of myself. The one you had on IG today is exactly the kind and color that I’m hunting for. Yes, it was a lovely trying-on session and I bought a winter hat, which you’ll see, in the winter. But that large brimmed fedora, I might have to save up for that as I do think about it. 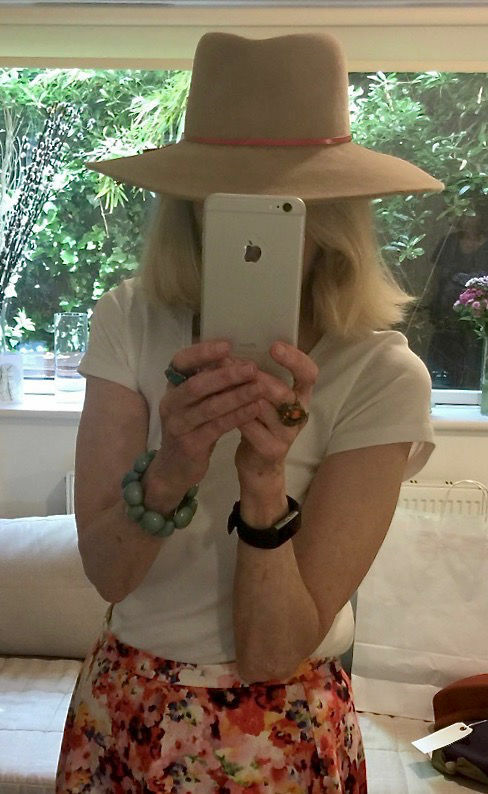 Also you’re not the only one to say it’s a great hat – soooo, I just might!!! Those sparkly dresses are like something from Cinderella – I guess they must be prom type dresses? I really love that skirt and top combo, second pic. The pattern matching is so great! I’m continually getting rid of clothes and shoes, but I struggle with things like “my archive,” which is a collection of writing, essays, scrapbooks and so on since I was a kid. I have no-one who would want it when I go, so I know I should get rid of it but I can’t. And I have TONS of books – hardbacks – but charity shops round here don’t want them. It’s a dilemma. 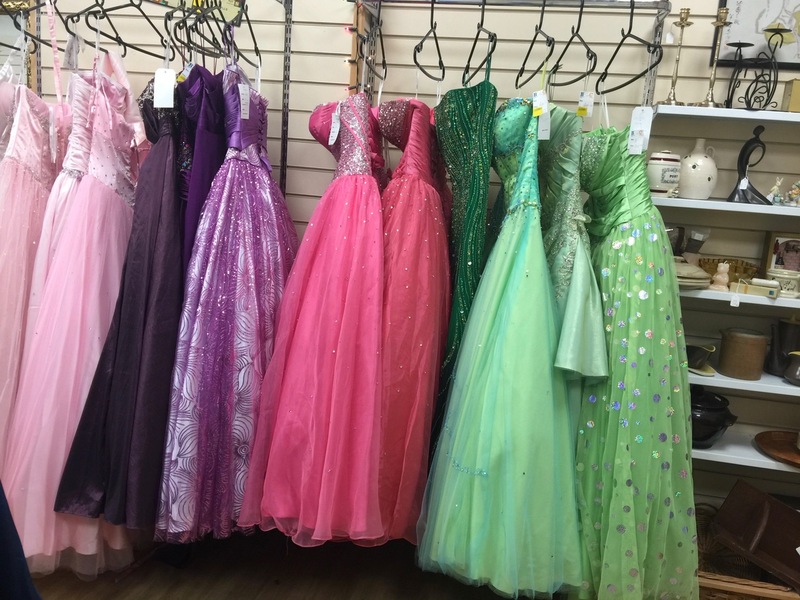 I asked about those sparkly dresses as they were unusual for a small charity shop (took up half the shop) and the answer was they were prom and Pride dresses. Re: your de-cluttering, books yes, as they can always creep back and/or be bought anew and surprised they can’t be taken – you’ll have to do it in small amounts! But scrapbooks and essays, actually, do keep them. I think that kind of collection should be kept for later. They could become a project when you’re retired and you could make something out of them. As in you don’t know now what that could be, but when you have more time you will – therefore keep!!! I think when in doubt about whether to keep or throw , best keep and sleep on it. Books I will give away but never throw out. I do look at my stuff sometimes and think ” who’se going to want all this ? ” I’m having a lovely old armoire cupboard renovated but it’s going to mean a serious clear out it the room where it will go. I’m actually looking forward to that ! I love the pinky floral skirt: so feminine. Recently I visited our local hospice 2nd hand shop. It does a roaring trade, and I do think that it is partly because they don’t try to charge exorbitant prices. Anyway, it looked as though someone my size and colouring, had donated a stash of clothes. 🙂 One navy/royal blue luxurious long tee; 3 sort of gypsy-ish long sleeved tops in bold colours; 1 royal blue unusual longish top-tee. $20 all up, so that’s maybe ten pounds. Am very happy with my haul.